How to draw bunny. Learn to draw a cute bunny step by step images along with easy to follow instruction. Bunnies are small mammals found in several parts of the world. Bunny is a small mammal with large and often long ears with a short tail. It is covered with fur. In this tutorial, we will draw a bunny with full body. Most of animals and creatures are different in shapes and forms depending on their families. The best way to approach the drawing is identify simple shapes within the body. It will help to define the main parts of each animal by breaking it down. Rabbits are herbivores that feed by grazing on grass, forbs, and leafy weeds. In consequence, their diet contains large amounts of cellulose, which is hard to digest. Rabbits solve this problem by passing two distinct types of feces: hard droppings and soft black viscous pellets, the latter of which are immediately eaten. Rabbits reingest their own droppings to digest their food further and extract sufficient nutrients. Rabbits graze heavily and rapidly for roughly the first half hour of a grazing period (usually in the late afternoon), followed by about half an hour of more selective feeding. 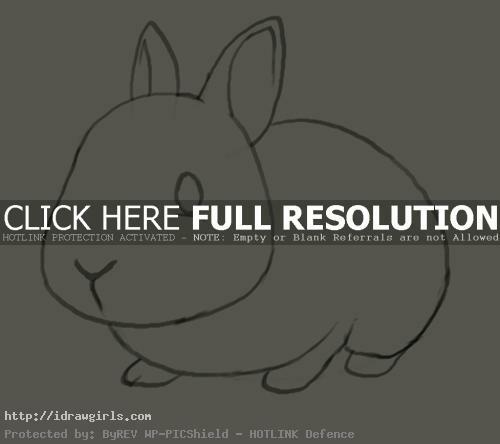 Below are step by step how to draw cute bunny. Step one, I started with the big oval like shape for its head. Step two, I then drew two long ears and an eye. Step three, I added nose in “Y” shape and earlobe. Step four, I drew another oval shape for its body. Step five, I added two small front legs under the body. Step six, I then added hind legs as final step. Done!